The 2016 Presidential Election has seen some startling developments including the unprecedented non-endorsement of a candidate by USA TODAY. We too have never taken sides in an election. Because this one is like no other, we have decided, after careful consideration, to endorse Dave Kovic for President of the United States! There is something particularly riveting about watching a film where an actor plays more than one role. 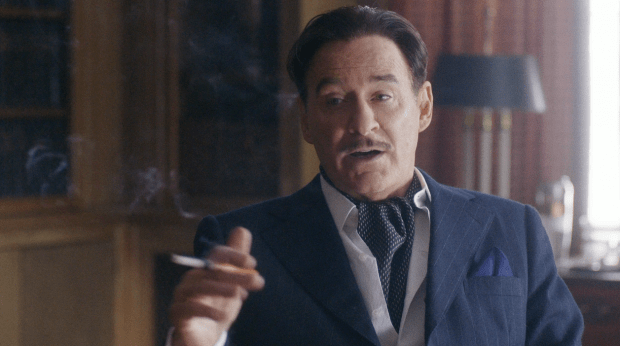 Ronald Colman in The Prisoner of Zenda, Hayley Mills in The Parent Trap, Michael J. Fox in the three Back to the Future films. Even Ginger Rogers in The Major and the Minor. It is that combination of technical know-how, make-up, and the sheer skill of an individual actor that produces the peculiar exhilaration one can feel. Cinema is, after all, about role playing and the illusion of reality, an image of reality. What can typify this more than the concept of dual or multiple roles? 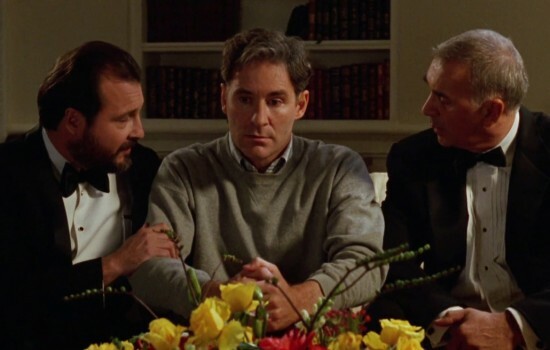 As someone who’s excelled at both drama and comedy, Kevin Kline is ideally suited for a dual role. He’s moved us to tears in Sophie’s Choice (1982) and made us laugh many times in movies like A Fish Called Wanda (1988). 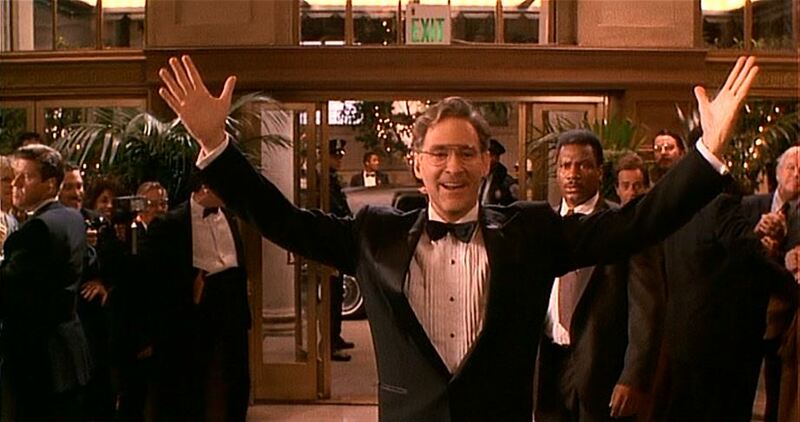 He’s also been an important part of ensemble casts in The Big Chill (1983), Silverado (1985) and Grand Canyon (1991). More recently, he even took on Errol Flynn in The Last of Robin Hood (2013). Versatility is a keyword with Kline. 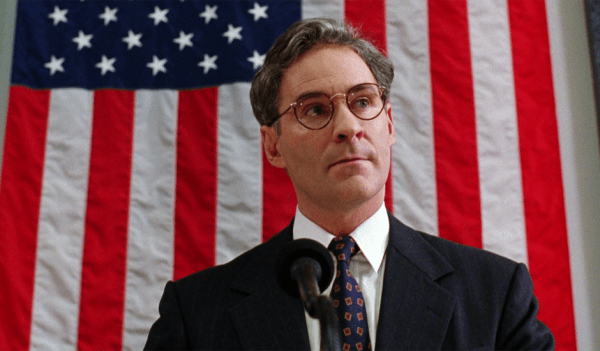 In Ivan Reitman’s romantic comedy Dave (1993), Kline plays the dual role of President Bill Mitchell and Dave Kovic, an impersonator who has an amazing likeness to the President. 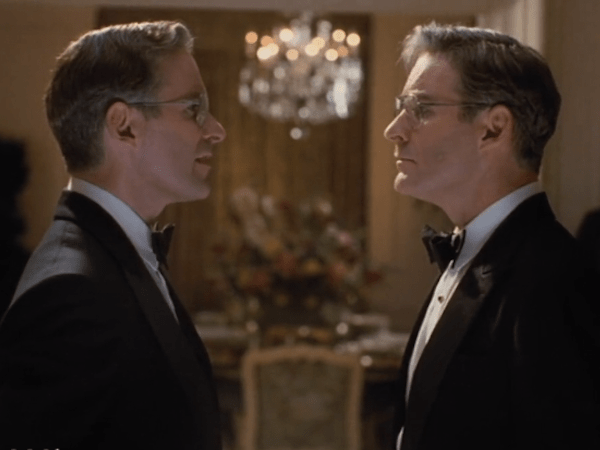 President Mitchell on the right confronts his mirror image. Secret Service Special Agent Duane Stevenson (Ving Rhames) comes calling. After convincing Dave it’s not about income tax deductions, Duane enlists him as the President’s double for certain events. The ulterior motive is for Mitchell to carry on an affair while the press and public watch Dave. The plan backfires when Mitchell has a stroke. It’s not “a little one” as his handlers tell the press but a near fatal one that leaves him brain-dead. There’s a plot hatched by Mitchell’s Chief of Staff Bob Alexander (Frank Langella) to install Dave as puppet president. Meanwhile, Mitchell’s body is hooked up to an iv in the White House basement. It’s the beginning of a wild satire and this isn’t the half of it. Mitchell doesn’t last long in the movie, but he shows his arrogance and unlike-ability, in contrast to the bike riding nice guy, Dave. Since it’s part of the setup that Dave is an impersonator, it makes sense that he’d have Mitchell’s voice down. He fools the press and public, but can he fool the First Lady? 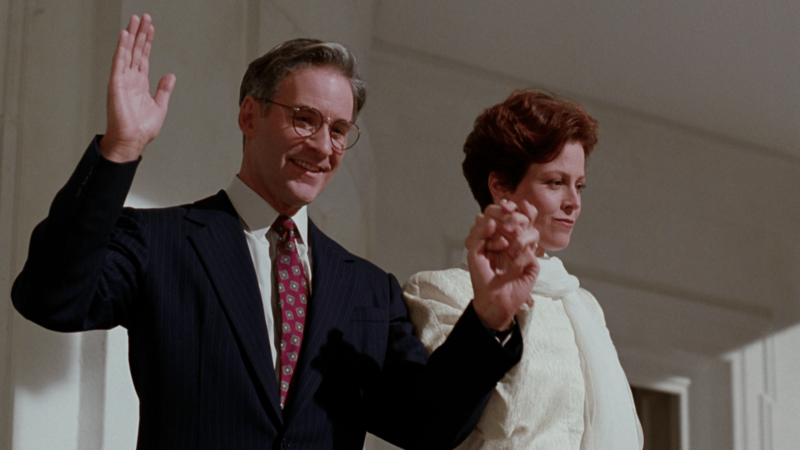 Ellen Mitchell (Sigourney Weaver) and the President live separate lives within the White House, so it’s possible to pull off. Part of the fun is watching Dave slowly win over Ellen. Because of Mitchell’s history of infidelity, it’s an uphill battle. Dave was released long before the Lewinsky affair. Of course, Governor Clinton’s affairs were well-known so an impending scandal could not have been too difficult for screenwriter Gary Ross to imagine. Weaver shows a range of emotions as a bright woman stuck in a prestigious but thankless job.The actress also proves herself adept at comedy and has an infectious chemistry with Kline. Charles Grodin is Dave’s accountant who helps him balance the national budget. His parting words to Dave are “Get out now!” Speaking of thankless jobs, Sir Ben Kingsley is Vice President Nance, who’s meant as the fall guy in Bob’s scheme to take over. When Oliver Stone appears on the Larry King Show with evidence of a conspiracy and cover-up surrounding the Mitchell Presidency, it looks like the game’s up. But Dave has one last trick to play. Thanks again to Christina Wehner and Ruth of Silver Screenings for hosting the Dual Roles Blogathon. Visit them for a recap and a complete listing. This entry was posted in Events, Movies and tagged Ben Kingsley, Charles Grodin, Dave, Ivan Reitman, Kevin Kline, Laura Linney, Oliver Stone, Sigourney Weaver, Ving Rhames by crimsonkay. Bookmark the permalink. No way! 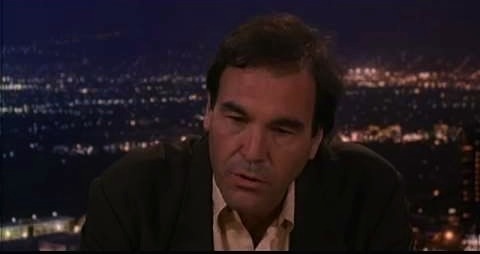 Oliver Stone is in this film talking about conspiracy? Awesome! I can’t believe I haven’t seen this one yet. I agree re: Kevin Kline. He is superb in drama and comedy, and I can imagine he’s terrific in this role. 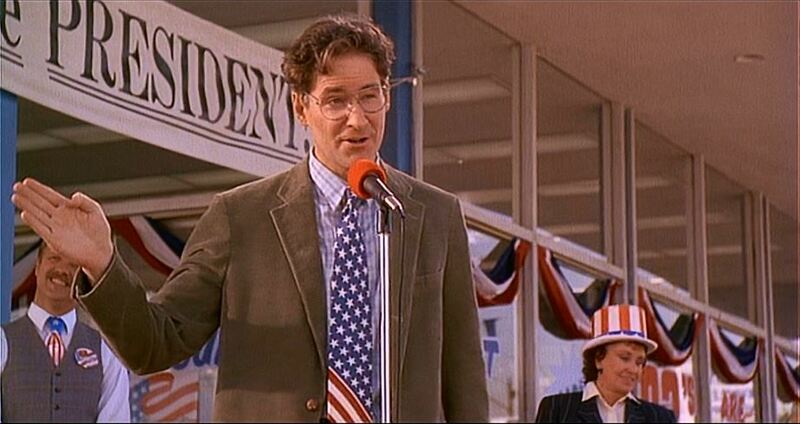 Hey, do you think this movie is making a comeback of sorts with the U.S. presidential election this year? I see more and more references to it on social media. Thanks for joining the blogathon, and for bringing DAVE with you! My hubby keeps telling me I would like this movie, but I had to wait until I heard it from you. Okay. It is officially on the watch list. Thanks, all, for the likes and comments. Glad I could spread the word about DAVE through this blogathon. Besides Oliver Stone, other famous faces show up, some of them now gone. And don’t forget to vote. Excellent post, and a great choice of topic for the blogathon. I must admit that I’ve never seen this film, though I’ve always heard a lot of positive reviews about it. Glad to stir up some interest in this film. You’ll be surprised how innocent a time 1993 looks. Thanks for the invite and good luck with the blogathon. I love Agnes Moorehead! I’ll look through her filmography and see. Thanks. I’ll definitely check the film out. It’s quite often being referenced to. Let me know if you decide on anything for the Agnes blogathon. I really liked this movie. It pairs well with “Moon over Parador”. If you haven’t seen it. it involves Richard Dreyfuss having to pose as the President of the fictional country of Parador, with Raul Julia excellently playing a similar role to Langella’s in this movie. Hmm. maybe its time I reviewed that one on my blog. Great review.